Cats are an important part of our lives. We cherish their company and love. 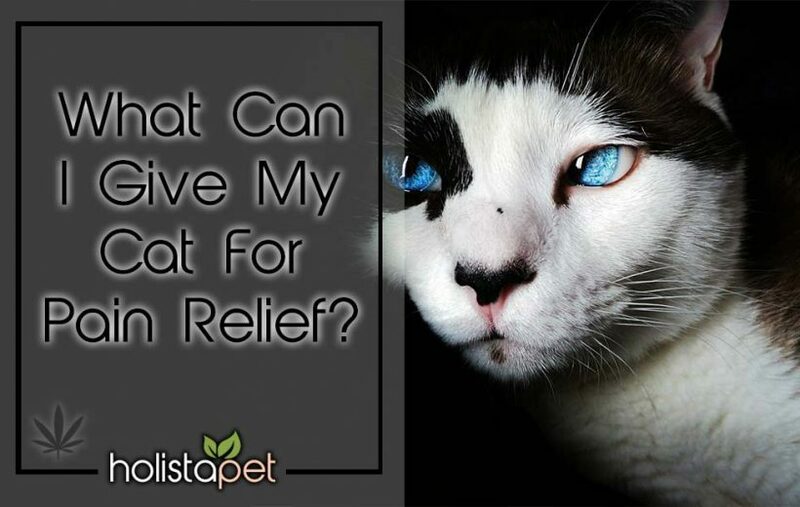 Unfortunately, sometimes cats can suffer from irritable bowel syndrome (IBS) and as a result can cause a variety of uncomfortable or even debilitating symptoms. A surprisingly powerful and new therapy for IBS in cats is (CBD) cannabidiol. CBD is an extract from hemp plants. CBD from hemp is natural, safe, and highly effective! Irritable bowel syndrome (IBS) is a medical condition that is caused by chronic inflammation in the gastrointestinal tract (GI tract) of mammals. It is the primary cause of GI tract issues in cats and is a fairly serious condition. If left untreated, it can progress to full-blown irritable bowel disease (IBD). In some cases, the terms IBS and IBD are used interchangeably, although they are two separate diseases. IBD is the more serious of the two. In general terms, IBS is basically a “sensitive stomach”. This means that your cat just has a general hard time with digesting their food and has frequent, sickly bowel movements. 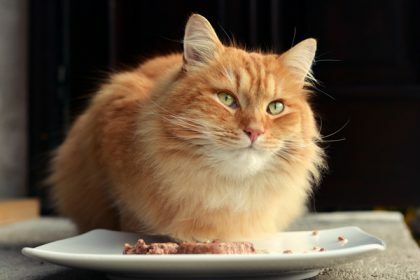 It may also result in your kitty being a “fussy eater” as they may not have a healthy appetite due to their IBS. Chronic, untreated IBS can result in a variety of other issues for cats. IBS is the digestive system malfunctioning, it means that the cat may not be properly absorbing nutrients from their food. This can lead to malnutrition for the cat. Malnutrition can lead to a whole variety of medical problems. Furthermore, IBS can also result in a compromised immune system. Over half of your cat’s immune function is within their GI tract. A dysfunctional GI tract results in a weaker immune system. What Causes IBS in Cats? IBS is a general term for a broad condition, meaning that it is possible that the disorder is the result of a combination of the above causes. Again, taking your cat to a veterinarian will allow you to determine the cause of your cat’s IBS so that you may most effectively treat it. These symptoms can range from mild to completely debilitating. It can also be a nightmare for a pet owner since the disease can cause the cat to have little control over their bowels. Therefore in many cases, they are not capable of making it to the litter box before defecating. Once these other conditions have been ruled out, then your veterinarian can make an accurate diagnosis. That is why it is important to get your cat checked out if they exhibit any of the symptoms above. What is CBD? How Can You Use CBD to Treat IBS in Cats? CBD is a health and wellness supplement derived from the cannabis plant. The types of plants they use to manufacture legal CBD specifically is industrial cannabis (more commonly known as hemp). CBD oil is manufactured by using the flowers, leaves, and stalks of the hemp plant. CBD has become one of the most innovative, promising, and exciting new developments in treating various diseases in the mammalian body. CBD is a cannabinoid, which is a group of compounds that play an important role in the mammalian body. Their primary mode of action is binding to cannabinoid receptors located throughout your kitty’s body. This results in a wide variety of beneficial attributes. These receptors are part of the endocannabinoid system (ECS) that is present in the bodies of all mammals. Your cat can easily metabolize CBD and will experience virtually no side effects! Furthermore, unlike other derivatives from the cannabis plant, CBD is not psychoactive. This simply means it will not make your cat high. While being high may be fun for some people, it generally results in agitation, confusion, or even aggression in your cat. Consequently, CBD treats both the symptoms of IBS (pain, nausea, and/or vomiting) as well as the underlying causes of the disease (chronic inflammation in the GI tract and/or stress). It offers double effectiveness making a potent and powerful tool with no adverse side effects. It packs a punch while still being gentle on your kitty’s body. The conventional treatments for IBS are mostly outpatient procedures. 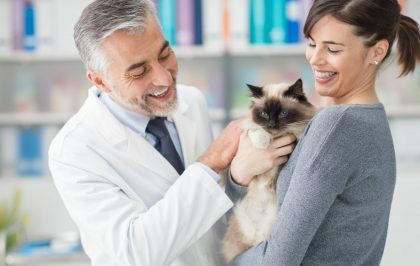 However, if the IBS progressed to such a point that your cat is severely dehydrated and/or malnourished, then they need to be admitted into a veterinarian clinic. Cats will typically be there for a few days while they nurse the felines back to an appropriate level of health. They will probably recommend a dietary regimen to help manage the cat’s IBS. Diet plays a huge role in the expression and severity of IBS in your cat. 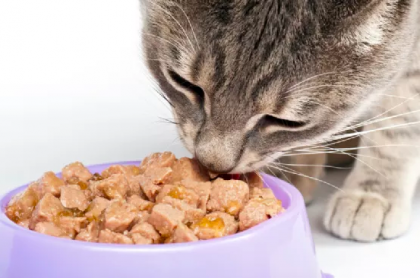 If your cat has IBS, your veterinarian may require a hypoallergenic food trial. This is basically a process of elimination in determining what kind of food is causing GI distress. You will have to feed your cat a protein (such as rabbit, venison, or duck) and carbohydrates diet. They want to limit their food intake to only those sources. If your cat’s condition improves, then you know that they can tolerate that particular food very well. Other changes to the diet may include foods that are high in fiber, low in fat, and easily digestible. Other factors that will influence this diet may include your kitty’s age, breed, level of activity, and/or any other medical conditions. Remember that a primary cause of IBS is food allergies or dietary intolerances. Remember that IBS primarily comes from chronic inflammation in the GI tract. Consequently, a commonly prescribed drug is prednisone (a corticosteroid). Your veterinarian may also prescribe antibiotics or immunosuppressive drugs. These are used to treat infections and chronic auto-inflammatory responses in the GI tract, respectively. Recent research has also indicated that probiotics and prebiotics are useful in creating healthy gut flora. This is the term for the various beneficial bacteria that live in the mammalian digestive system and help your kitty digest its food. Stress is a major trigger for IBS. When the mammalian body is stressed out, it releases a variety of hormones that are necessary for survival responses. However, if this stress is chronic, then these hormones can start to have deleterious effects on the body. Anti-anxiety medications may be prescribed to help your cat better deal with their stressful environment. Regular human interaction and healthy stimulation through toys, play, and regular exercise will also decrease the levels of these stress hormones in your cat’s body. The most effective maintenance for IBS in cats usually consists of a combination of these various approaches. CBD is particularly helpful because you can easily supplement in any or all of these treatments without causing any kind of negative interactions. In fact, it will only increase the efficacy of other drugs or treatments. Is CBD Safe for Your Cat? Yes, absolutely! In fact, it is extremely safe for your cat. It is impossible for your cat to overdose on and if you give too high of a dose, your cat will simply sleep it off. You may also refer to our CBD Dosing chart when determining what dosage to start your cat on. This will make sure that the proper concentration of CBD is present in each product sold, thereby resulting in exact dosage amounts. Furthermore, this will ensure that you can safely and effectively treat your cuddly cat. Each batch is further tested for various cannabinoids and their amounts, including CBD, cannabinol (CBN), cannabidiolic acid (CBDA), cannabigerol (CBG), cannabichromene (CBC), and tetrahydrocannabinol (THC). Holistapet utilizes CO2 (carbon dioxide) extraction for the manufacture of their CBD products. This is a green method that is environmentally friendly. During this process, extractors filter out all harmful chemicals and/or toxins from the final CBD product. All of these tests are undertaken by third-party entities in order for Holistapet products to receive certificates of analysis (COA’s). CBD is a safe, natural, and effective way to treat IBS in your cat!